So much is going on in our life right now and so many un knowns!!! Several things have got me thinking about life. All of the joys and triumphs and the frustrations and failures! This has me thinking back to the beginning again! Good thoughts seem to come more freely these days as we have overcome so much! Do I still wish that I could erase that dreadful day in March....... Yep..... But I can't! I left the hospital with my baby girl after 5.5 weeks not able to do ANYTHING a child her age should do including the ability to eat! She moved NO parts of her body and I don't believe at that point she could see or hear. She had a blank stare in her eyes and would not make any kind of eye contact. Lights on, nobody home!!!! Not a joke! She CRIED ALL the time! She didn't sleep, and she puked her food and wasn't gaining weight! I know many of you have heard this many times but some have not. So thanks for bearing with me as this event with my friend has brought me back here again! Fast forward just over 2 year later. Makenzie sees, hears, makes eye contact, can eat a bit through her mouth, laughs, smiles, loves games, talks by using a switch that she pushes with her hand.... yes that is right... she IS using her hands!!! There was a time that I didn't think her hands would ever do anything!!! She is walking by herself in a gait trainer and rolling over. Yeah God!!! I often, however get frustrated with the things she can't do like sitting up! I watch some kids heal much faster and it makes me MAD!!! Yes, I even yell at God through my tears with the why isn't that my kid doing those things statement! Truth me told I am human and yes some days I am PISSED! One night not long ago I cuddled up next to Makenzie. She was sound asleep and looked so perfect! I realized how much I have! Her smile and laugh makes it all worth while! Her perfect soul and love for life makes everything bad fade away most days! I prayed when I was pregnant with her that my daughter would grow up to be my best friend! This was not the way I would have chosen it to happen but......All of my kids are so perfect in every way and Makenzie is STILL that daughter that I always dreamed of!!! As we get ready to go to Disney and Costa Rica and then The Napa Center my brain is overwhelmed with all there is to do! I can't wait to spend time with the boys at Disney! To see my kids walk into the Most Magical place on earth will be priceless!!! Then on to Costa Rica for Stem Cells! To top that off we will be meeting another GREAT friend there! We will also be able to spent tons of time with another GREAT friend in CA as both of our kiddos will be doing Suit therapy at the same time!!! This has me thinking about all of the people we have meet in the last 2 years who are walking down similar roads of heart break and special needs!!! I feel so blessed! It is so great to have you ALL in my life!!! You add so much to it and really are the ones that keep me sane! Thank you Michelle,Jodie, Lindsey, Julie, Stacey, Beth, Mandie, Stacey, Susan, Kahne, Jennifer, Jenny, Jenni, Cardie, Jamie, Naomi, Trina, Linda, Becky, Chelle, Christine, and Meredith. If I forgot anyone I am so sorry! WOW!!! Also ll of you that have supported us threw this just because you love us and want to help our family!! We would not be here with out you ALL!!! Thank You!!! So I guess the bottom line is LIFE IS GOOD! God is GOOD! I feel BLESSED! We have so much! There is still all of the unknowns and the hearth break and wonder but 2 years later it is better! MUCH better! 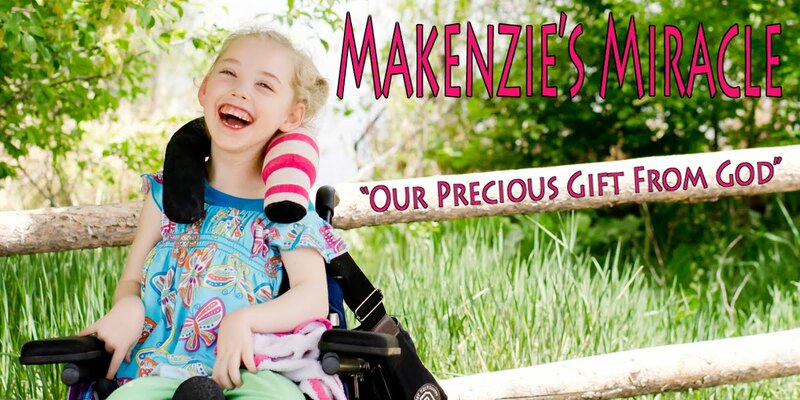 As we embark into more unknowns with hope that God will use the Stem Cells to give Makenzie more mobility and language.... any kind of healing really! That our 3 week trip to The Napa Center this fall will have good results as well! We need God's healing hand upon Makenzie! I am content! I am happy! Does that mean I am giving up? NO WAY!!! Not until the day Jesus takes me home!!! Pray, Pray, Pray, Pray!!! Keep BELIEVING with me.... PRAYER WORKS!!!! Thanks For EVERYTHING!!! !